There were times I couldn't bear to watch. But then there were others when his exuberance  physical and spiritual  made it easy to convince myself it would never happen, and so I would call up Randy Pausch's Last Lecture on YouTube and watch it with my children, receive the gift he was giving us and reject the idea that it would come at an ultimate price: that Pausch would indeed die one day of pancreatic cancer, as he did this morning, at the age of 47. You cannot change the cards you are dealt. Just how you play the hand. With his child's smile and nimble brain and breathtakingly simple instructions tumbling out one after another, Pausch made the infernally complex machine that is modern life look like anyone could put it together if they just had the right tools and the crib sheet. Come on, he seemed to say, you can do this; I have the secrets, and I'm giving them to you, for free. When his cancer was diagnosed in August 2006, doctors said he had maybe a few months. He went through an aggressive course of treatment, surgery, chemotherapy; but a year later the disease had spread to his liver and spleen, and he was told it was terminal. A popular computer-science professor at Carnegie Mellon University, he delivered his "Last Lecture" on September 18, 2007. It was a university tradition for popular professors to think hard about what mattered most to them and distill their ideas as though they had only one message left to give to the generation that followed. 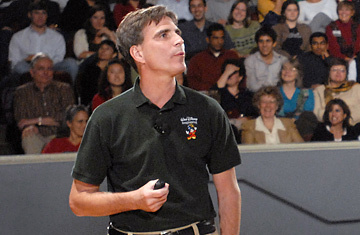 Randy Pausch was the first for whom the exercise was literal. It became a YouTube sensation, viewed many millions of times by people charmed by his easy manner, engaged by his lively insights into work, science, exploration, in awe of his complete lack of self-pity. He was the picture of health, with his thick dark hair and Muppet eyebrows, dropping to do push-ups on the stage, a defiant portrait of life with its edges all sharpened. Every sentence was soaked in gratitude, and listening to it could make you flinch at every time you'd whined or cheated or quit. The brick walls are there for a reason. The brick walls are not there to keep us out; the brick walls are there to give us a chance to show how badly we want something. The brick walls are there to stop the people who don't want it badly enough. You wondered whether, all across the country, children were whipping out the brushes and paint while parents stood resignedly by, remembering the pictures he showed of his own bedroom growing up, covered in doodles and math problems and rocket ships, and honoring his injunction. "If your kids want to paint their bedrooms, as a favor to me, let 'em do it." Last October Pausch appeared on Oprah, and his audience widened even further. He testified before Congress for better cancer-research funding. He got 10,000 e-mails recommending possible therapies. He spent a day hanging out with the Pittsburgh Steelers, which he'd mentioned as his own childhood dream. ABC News did a prime-time special in which we got to meet his wife Jai, his three young children, watch them playing and planning for what lay ahead. In April his book, The Last Lecture, swooped high on the best-seller list; his wife called it a "manual" for their family. Wise men have said they're not scared of death, but they're a little scared of dying. Death is just a mystery; but dying is the journey we don't want to take, and he used it to lead the living to a new place. It was as though he already knew more than he should, had dipped a ways into eternity and brought some pieces back for the rest of us to use in whatever ways and for whatever time we can. The end of the lecture, it turned out, was just the beginning. Did you figure out the head fake? It's not about how to achieve your dreams. It's about how to lead your life. If you lead your life the right way ... the dreams will come to you. Did you figure out the second head fake? The talk's not for you. It's for my kids.